Artificial turf are man-made surfaces that are designed to resemble natural grass surfaces. The grass on artificial turfs are made from polymer fibers such as polyethylene, polypropylene, and polyamides; the use of which depends on their characteristic features. For instance, polyethylene grass fibers are long lasting and gentle to the skin, whereas polypropylene grass fibers last longer, but is harsh to human skin. Artificial turfs has been proven to have a low impact on the environment as these are recyclable, require less water, and reduce the use of pesticides & fertilizers. These turfs is widely used for as sports pitches due to its high durability, low maintenance, superior quality, all weather utility, virtual appeal, and eco-friendly attribute. Furthermore, these turfs have applications in leisure & landscaping sector. Thus, the potential advantages offered by artificial turfs increases it scope of applications in the market. This is expected to offer lucrative opportunities to players in the market in near future. Factors such as replacement of natural grass with artificial turf in sports stadiums and eco-friendly attributes of artificial turf drive the growth of the artificial turf market. Moreover, increase in disposable income in developing and emerging economics has raised the purchasing power of the people, which in turn has led to use of artificial turfs for landscaping. However, high surface temperature of artificial turf and high cost of artificial turf hamper the market growth. The introduction of hybrid artificial turf offers new opportunities to market players in the near future. The report segments the artificial turf market on the basis of material, application, and geography. Based on material, the market is segmented into polyethylene, polypropylene and polyamides. On the basis of application, the market is segmented into contact sport, leisure & landscaping, and others. Geographically, it is analyzed across North America, Europe, Asia-Pacific, and LAMEA. The key players operating in the market include Victoria PLC (Avalon Grass), Sportfield Deutschland Holding GmbH (AstroTurf), CoCreation Grass Corporation, FieldTurf, Global Syn-Turf, Inc., Controlled Products, LLC (GrassTex), ForestGrass, Synlawn Artificial Grass, The Dow Chemical Company (DOW), and TigerTurf. 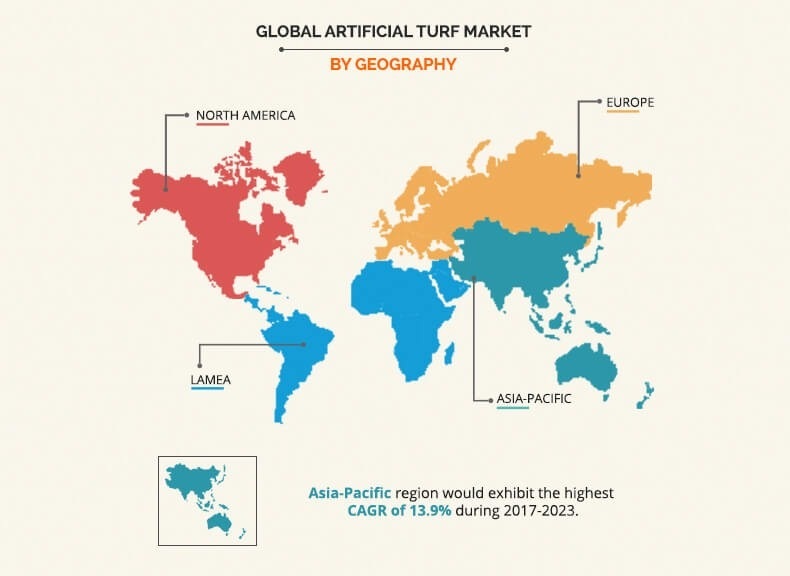 The Asia-Pacific artificial turf market has witnessed rapid growth rate due to of the sprouting sports stadiums, increase in inflow of investment in infrastructure, and rapid urbanization. Moreover, issue of water scarcity and improvement in lifestyle have supplemented the growth of the Asia-Pacific artificial turf market. 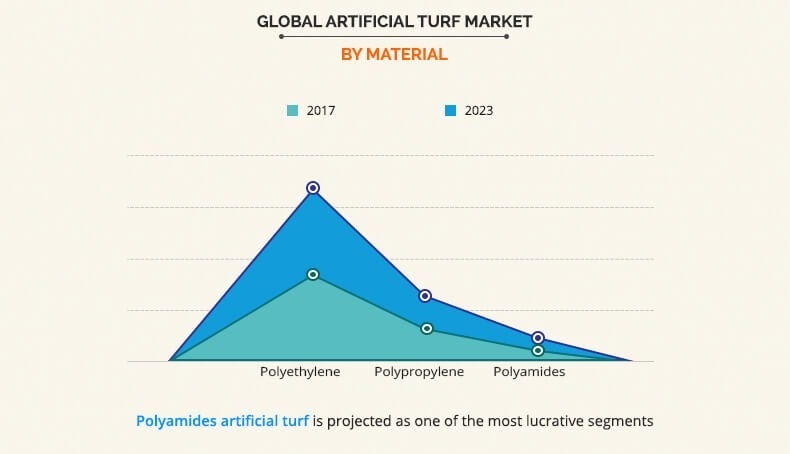 The polyamides artificial turf segment is projected to be the most lucrative segment, as polyamides are 33% stronger than polyethylene and 26% stronger than polypropylene. Furthermore, polyamides grass fibers hold color for a longer duration, has high melting point, and offers excellent wear resistance. The contact sport segment in application is estimated to be grow at a rapid rate during the forecast period, due to the need for high quality grass surface, which offers protection to players and offers good playing surfaces. Porters Five Force's analysis helps in analyzing the potential of buyers and suppliers and the competitive scenario of the industry for strategy building. 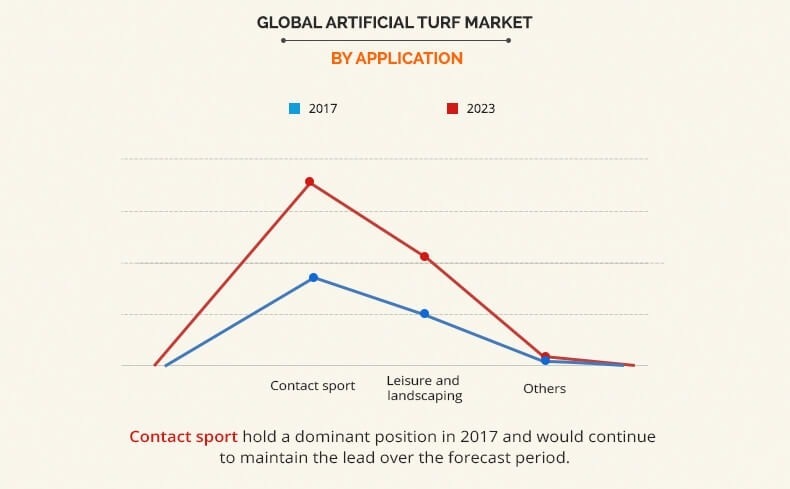 It outlines the current trends and future scenario of the artificial turf market from 2017 to 2023 to understand the prevailing opportunities and potential investment pockets. An in-depth analysis of the current research & clinical developments within the market is provided along with the key dynamic factors. Artificial turf is a surfacing material used to replicate natural grass. These are generally used in areas devoid of grass as well as places requiring durable grass surfaces. Recently, these turfs have been in high demand in sports stadiums and arenas due to their high durability. They are generally made up of polymers such as polyethylene, polypropylene, and polyamide. Each of these polymers comes with its own set of characteristics. Some of the advantages of using artificial turfs in sports include uniform high quality grass surface, low maintenance, weather resistance, and less chances of injuries. Furthermore, artificial turfs are used in the landscaping. Landscaping of lawn and backyard spaces of the houses has been a popular trend over the past few decades, due to the associated benefits such as low maintenance cost, eco-friendliness, visually appeal, and long shelf life. The global artificial turf market has witnessed an impressive growth in the recent years. The markets in Europe and North America have provided lucrative opportunities for growth in the last decade due to their high demand in sports clubs and landscaping. Through 2023, the Asia-Pacific and LAMEA regions are expected to grow at a significant growth rate as compared to the saturated markets in Europe and North America.